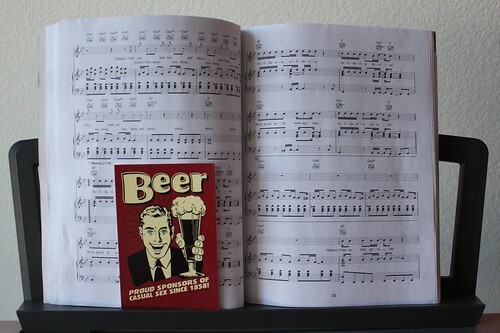 Beer Postcard, a photo by Stimpdawg on Flickr. This funny postcard is headed to my friends Andy and Elena who live in London, England. I love sending Andy postcards for his my REAL wall blog, so I can see them on the site. I saw this postcard in a souvenir shop on a recent trip to San Francisco. There was a lot of funny ones. 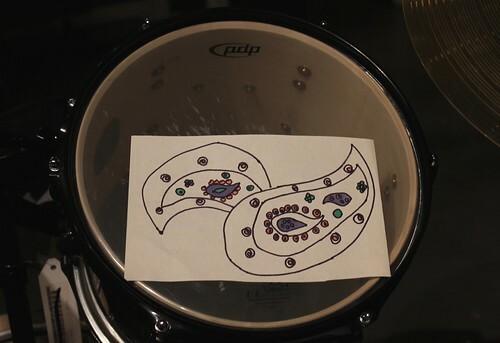 Can you tell me what musical the music sheet behind the postcard is from? You can see the larger picture by going to Flickr. Self-Portrait, a photo by Stimpdawg on Flickr. This is a mailart piece I made for the Postal Art Trinidad & Tobago project – Self-Portrait. 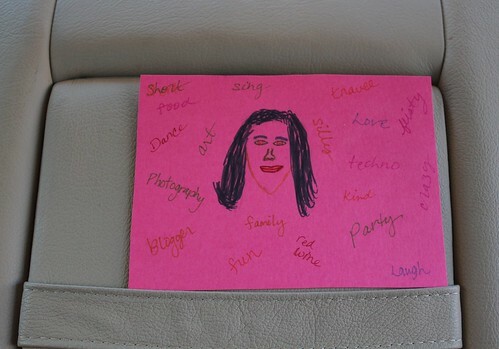 I drew myself and then placed words that describe me and things that I like. 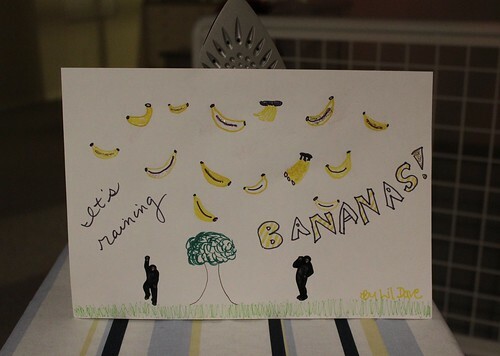 It’s raining BANANAS!, a photo by Stimpdawg on Flickr. Lil Dave made this mailart for Mini Camel. It took him awhile to perfect the banana. I helped him out with a few of them. He loves bananas and this is his dream – bananas coming from the skies! Here’s the back of the envelope. Lil Dave is running for President. Do you give your support? 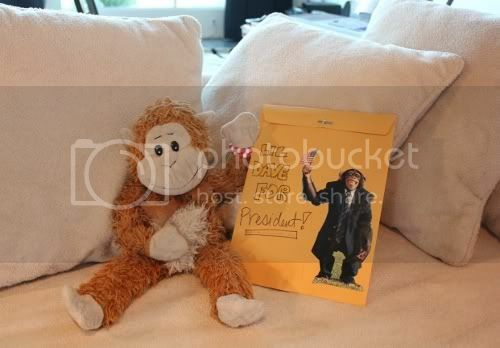 Lil Dave will probably be making more monkey mailart in the future. Lil Dave would love mailart from you, go to the Contact page to write Lil Dave. Blue Light in a Cave, a photo by Stimpdawg on Flickr. 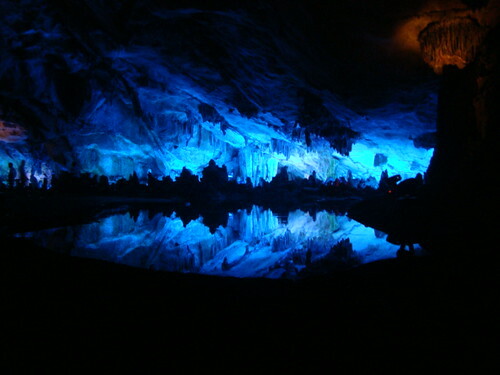 Here’s a great shot of the blue light in Reed Flute Cave in Guilin, China. It was near the beginning of our first RTW trip. Pretty Paisleys, a photo by Stimpdawg on Flickr. I created these pretty Paisleys for my friend Wroderick who lives in Oregon. I got the inspiration from a label from an apron we bought at Ross. Cactus at Red Rock, a photo by Stimpdawg on Flickr. 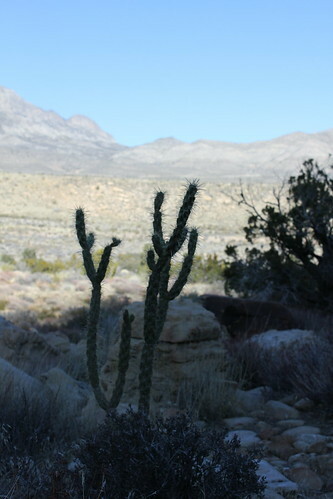 Here’s a picture of a cactus I shot at the end of the hike at Ice Box Canyon trail at Red Rock Canyon in Las Vegas. It’s beautiful hiking out there! I sent this postcard to the First Postcard project. I found this while traveling and I can’t recall where I picked it up. Pablo Picanté is a Californian burrito bar. It’s always great to find free postcards that you can keep or send to your friends. It’s also great to use postcards by cutting parts of them for your mailart. I love postcards! I’ve been sending postcards through Postcrossing lately. I would love to receive more for the House of Art wall.